This skillet breakfast is just 4 ingredients. 2 Spoonfuls of Cowboy Caviar Salsa - I used Trader Joe's brand (Cowboy Caviar is a salsa with corn, black beans and pepper). 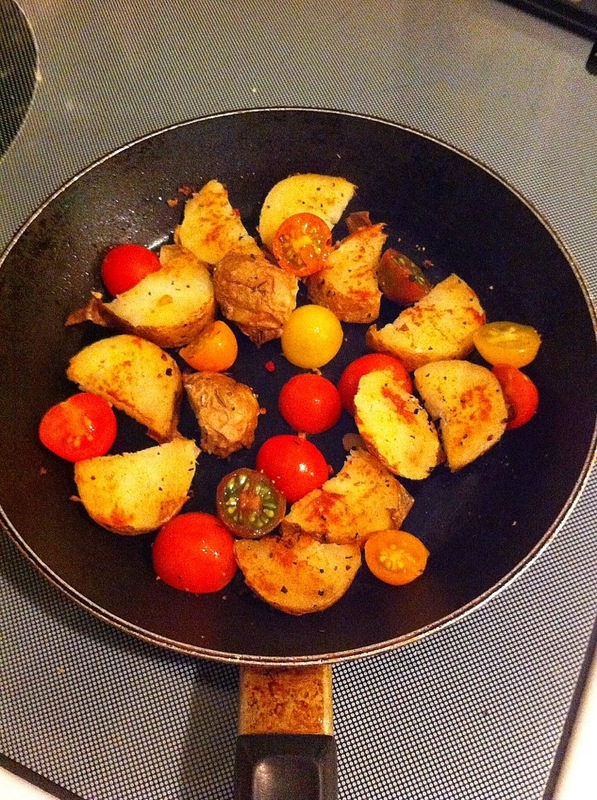 Slice the potato in 1/4 inch slices and cut tomatoes in half. Then using a skillet prepared with cooking spray, I put the potatoes in first to saute and brown one side, flip over and then add the tomatoes. Season up with your favorite seasoning. 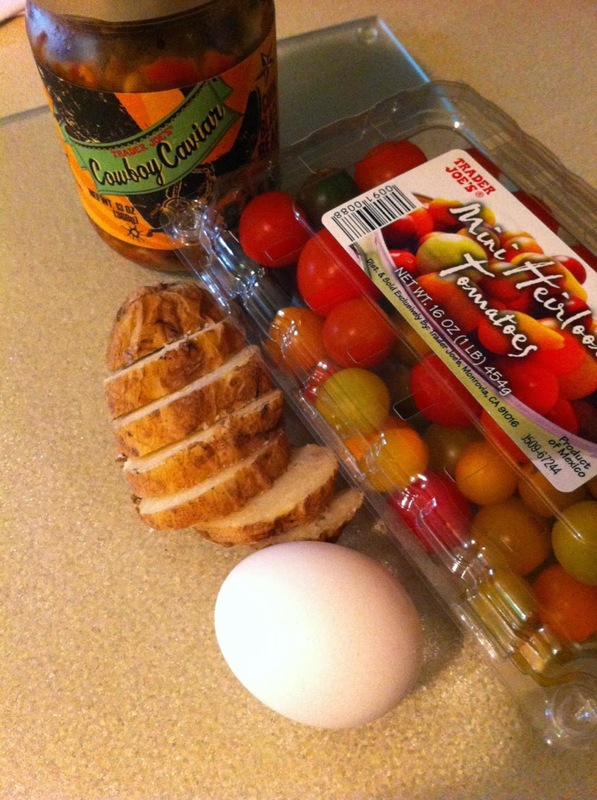 Once potatoes are browned and tomatoes are softened, clear a little spot to crack your egg(s). Add 2 spoonfuls of the Cowboy Caviar. Just plop it anywhere. Cover with a lid and let it simmer until the egg is done to how you desire. Runny or hard yoke...whatever gets you in the saddle! 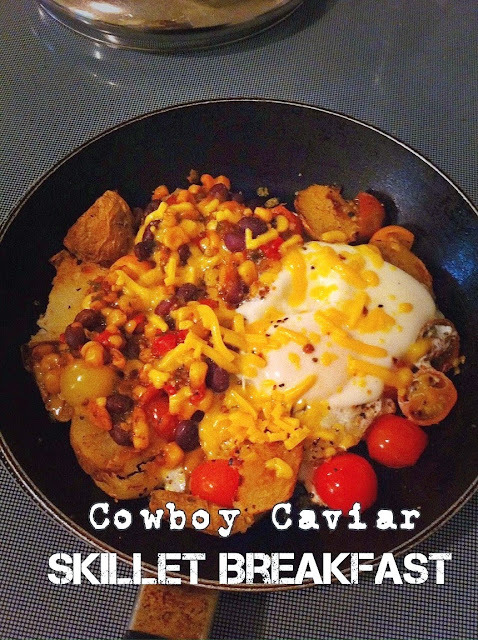 Sprinkle a little cheddar cheese if you'd like and serve up your skillet grub wearing only a cowboy hat! O.k maybe not just the hat - that'd be weird or possibly a very interesting breakfast in bed idea. Alright, let's keep it clean here partner. 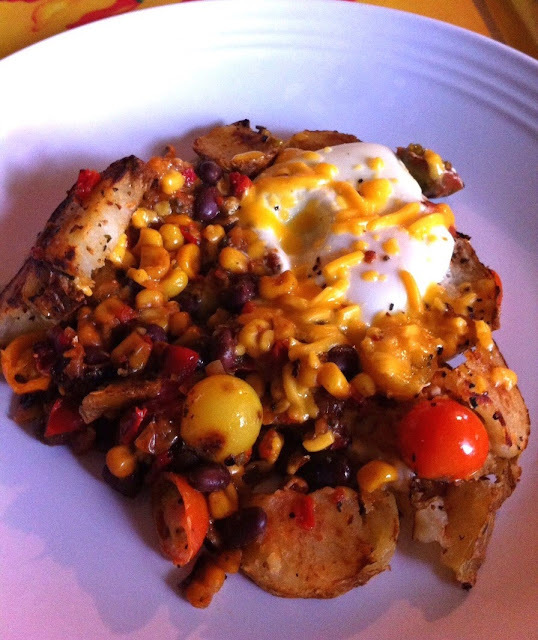 Hitch up the horse and enjoy a hearty healthy breakfast. Wrangling cows will just have to wait!